For the inaugural post of the series, we’re going to build a custom Hero Block. 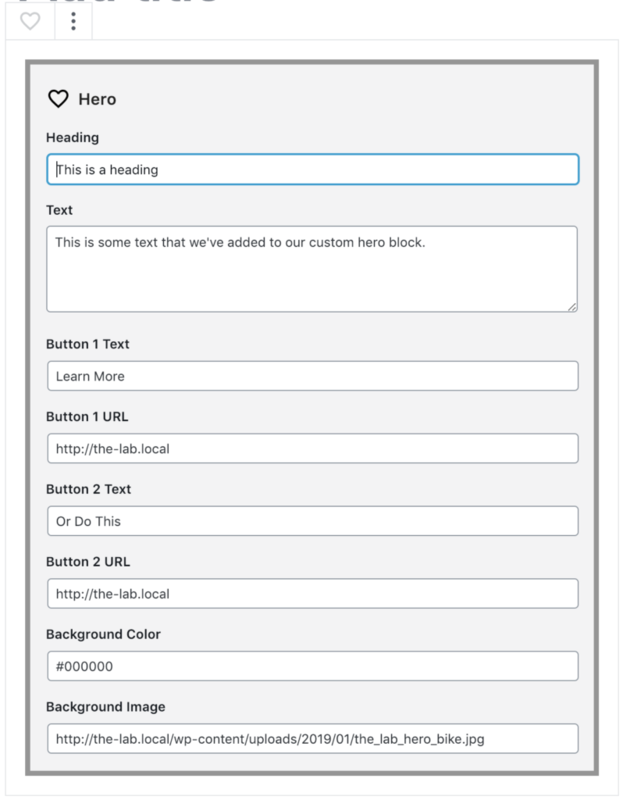 It’s going to be nice and simple and follow the typical design patterns you expect from the Hero section of a page. There will be a couple of extra controls that let you change the styling of the block, but nothing over-the-top. To see an example of what this custom block will be able to do, here are 4 examples. So take note of some features of this custom block. With this kind of block, it would make it pretty easy to beautify the first section of any of your pages. So, before we get in to the step-by-step, here is our setup. Fresh WordPress install (v5.03). Block Lab plugin installed and active (v1.1.2). Atomic Blocks child theme installed and active. We’re using the Atomic Blocks theme for 2 reasons. 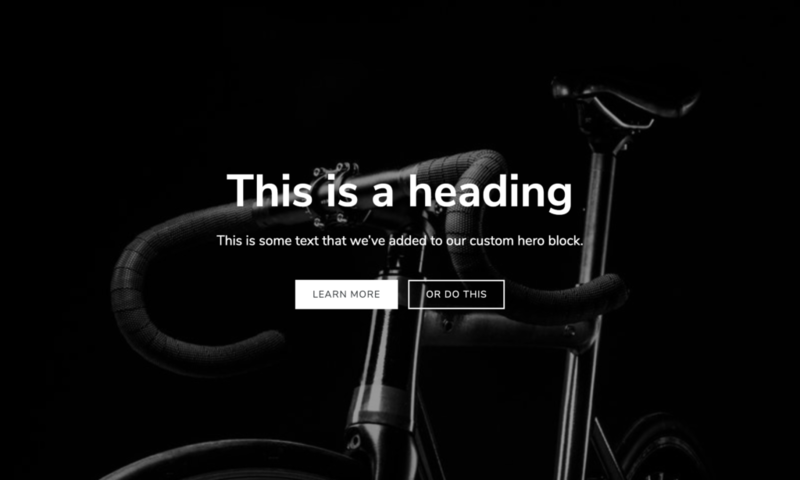 It has a great blank “page builder” page template that works as a good blank canvas for working with a Hero kind of block. Ok, let’s do this! By the end of this tutorial, this is what we will have built. Keep the automatically generated slug. Choose an icon, set a category, and add some tags. Ok, these are the fields we’re going to add. Take note of the field locations. 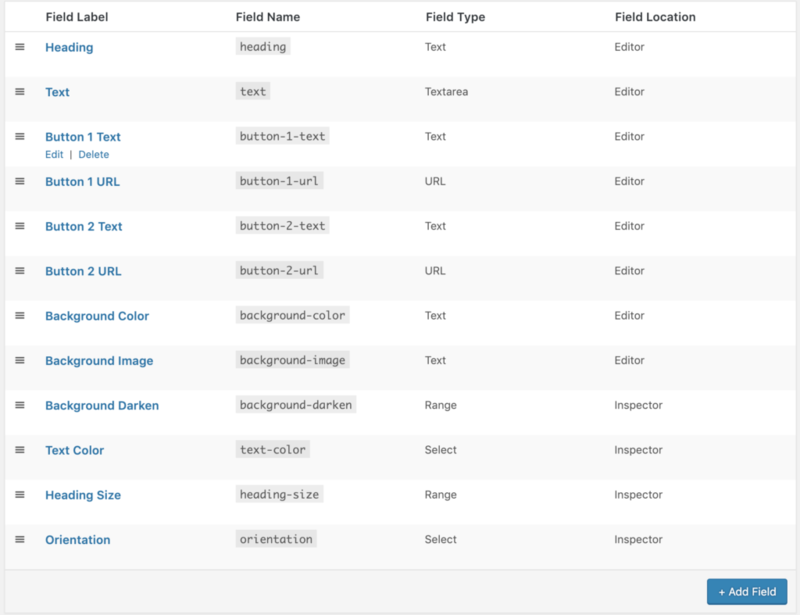 Rule-of-thumb is that content fields belong in the editor and settings/configuration fields belong in the inspector. For our background image field, we’re using a Text field. A Media field is coming to the plugin very soon, which would actually be used here. In the meantime, we just paste an image’s URL in to a Text field. Add all these fields to your block, and hit Publish. Time to open a text editor. I use VSCode, but there are plenty you can choose from. 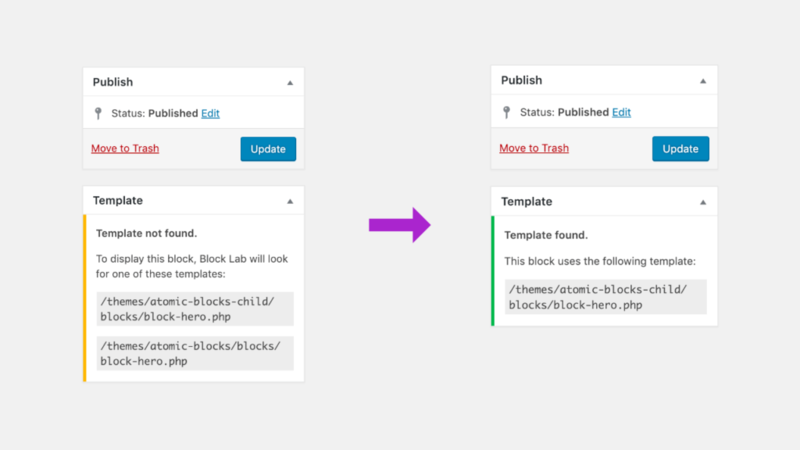 In our Block Building screen in the WP Admin, you’ll see over on the right that the plugin is looking for the block template file for your new block. As we’ve only just added it, it’s telling us it can’t find it. Helpfully it’s also telling us exactly what it’s looking for. 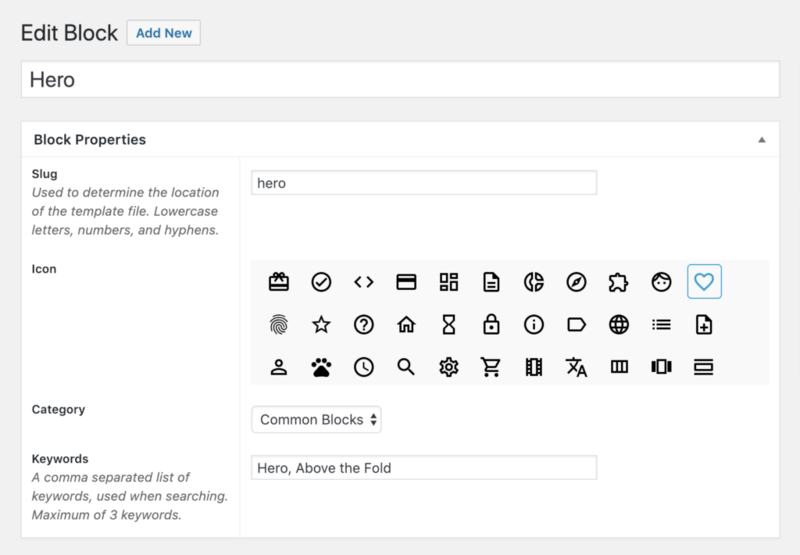 Copy the file name block-hero.php and open up your active child theme files in your text editor. Add a folder called blocks. In this new folder, add a new file and paste in block-hero.php as its file name. Hit save. Switch back to our block editor in WP Admin and hit refresh just to make sure it’s picking up the new file. Now, we build the template. We’re going to write some simple CSS, HTML, and PHP in our template file. There are other ways to do this, including building a preview template file for the block, but for simplicity’s sake we’re going to do it all in this single file. We’ll have 2 sections in our file. CSS at the top, and HTML and PHP at the bottom. I’ve also added CSS classes to each HTML element. Next step is to add the content of our block using Block Lab’s available functions. With the block_field and block_value functions we’re going to add our content and base styling fields first and then work with the setting fields (ones we added to the inspector) later. Our block template file now looks like this. By using the block_field function, we echo out the value stored in the database in that particular field. Let’s take a quick stock-take of what we have. 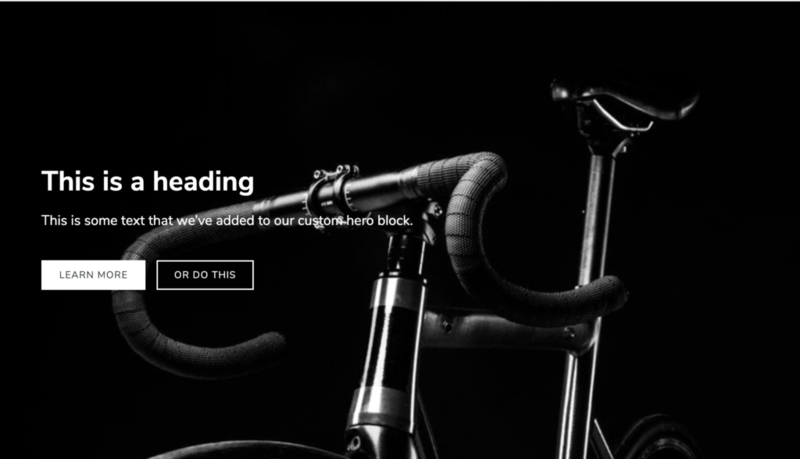 We should now actually be able to add our custom block in a new post or page in WordPress, add in content, and have it work in both the editor and frontend. So, in the WordPress admin, go to Pages > Add New. Now add a new block and look for our “Hero” block. Add it to the page and fill in the fields. Now click away from the block to see the preview in the editor. And then click the preview button to view on the front end. Hey presto. We have a functioning custom block. Now to make it pretty and customisable. We’re going to add our CSS to the block template itself to keep it simple. Alternate and more DRY ways include adding it to a plugin or a centralised stylesheet. Our CSS is fairly simple. It’s mostly about giving the Hero section the proper amount of space and alignment on the page. The buttons also get a bit of attention to make sure they actually look like buttons (we’re using anchor tags) and work well against the background images or colour. With this styling, we have basically completed the block! With the image added to the background field, this is what we see. This here is looking really good. We could finish right here if we wanted. However, let’s add some block settings that let the user tweak the block to make it better suit their case-by-case needs. And now, without further ado. Here is our block. I really hope you’ve found this tutorial interesting and helpful. If you have any ideas of what you’d like to see in future ones, please let me know in the comments below. Few people have asked for Video tutorials in future months. 🙂 Anyone else like to see this? Definitely. New to this level of customization but excited about what I can do with Block Lab. Nice to see how you implement a background image. Still hoping for the media upload field instead of having to write out the image url. We’re very close to releasing the media fields. Before the end of Jan is the plan, if not sooner. Buy an Early Access Pass for Block Pro and save 75% on the annual license for unlimited sites.